I’ve just published my fifth book, (an eBook: The Ormita Report), and it’s been a marathon effort involving risk, intrigue and ethical issues galore. This post shares the inside story of a Kiwi author, blogger and IT entrepreneur virtually single-handedly taking on a guy who has terrorised an entire industry for years. When I pushed the “go buttons” to publish The Ormita Report earlier in the night, I delivered on a pledge that I made in Q4, 2013. I had promised to deliver a 10,000 word report detailing my findings into a con artist going by the name of Daniel Mensi Evans. It’s all in the Report and various websites but it ended up 60,000 words and when I pushed “go” it felt good – really good – not only because of the contents but mainly to have delivered on time as promised. Believe it or not, I suffered from chronic low self esteem for the first 29 years of my life. You’d never guess it with the publication of the YouTube video that presents a very serious matter of this fraudster directly and pretty succinctly! The YouTube was done with selfies on an el-cheapo Nokia cellphone, the cheapest ones that Samoa had to offer at the time and put together in eastern Europe under my remote instruction. I’ll be doing more videos in due course with messages that I want to communicate – Ormita and other topics. 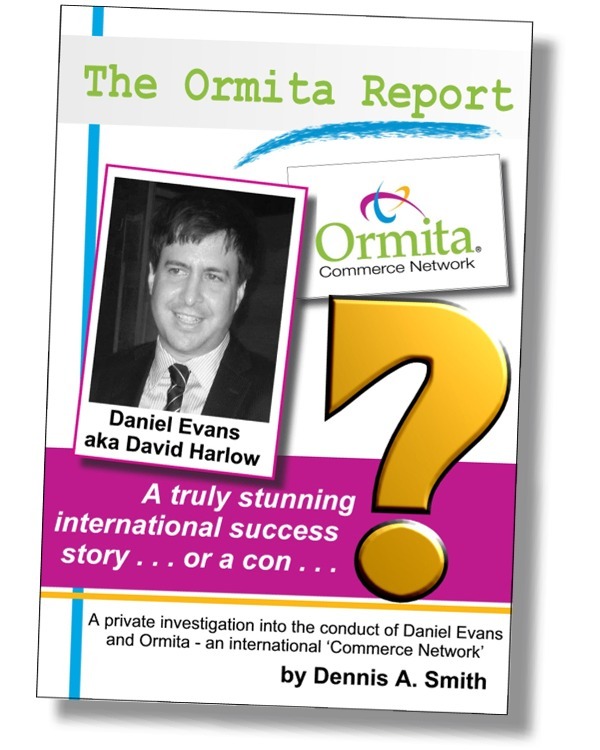 The Ormita Report reveals the truth about international fraudster Daniel Evans and his business fraud: the Ormita Commerce Network. Daniel claims he has the world’s largest trading network with hundreds of thousands of members in dozens of countries and 3.4 billion dollars in annual turnover. This is a LIE. Ormita is little more than a one-man-band using smoke and mirrors to defraud investors the world over. If you are in the barter industry you if you want to be, then you are a target! I had detractors. I knew a friend from church who was an ex-policeman in a senior investigation position in commerce but he wouldn’t touch it with a bargepole – not even to give me personal advice. That hurt but it toughened me up to back myself. My estranged wife emailed me a cryptic email along the lines that I was crazy – again it forced me to back myself even further. Others slipped in constant reminders that the conman had messed with their lives, personally and commercially and that they didn’t envy me with my undertaking. People on the team failed to deliver as promised. Key witnesses wouldn’t talk. People I respected disagreed with some of my findings. What can you do in such circumstances? Well, ‘work’ came to mind. I just pushed on no matter what keeping on asking questions of all and sundry, and I got the job done! I had challenges on the ethics front with The Ormita Report. What started as an idea turned into a mission as I came to see more of the damage that the guy had caused, and was causing around the globe. Exposing him for what he was doing and had done was relatively straight forward, but exposing him for who he is wasn’t quite so simple. I had to work in the full knowledge that he, and his business was very likely to be destroyed once the report came out. I had to be very sure that I had my facts correct and that I had the evidence. I had to be ready for any eventuality – literally anything – and to be ready to deal with very likely an angry man that had a track record of extreme behaviour, stopping at nothing to get his way. But I had the truth; I worked with only the truth and wanted only the truth. That was enough for me to push through with the investigation and the writing until completion. With the work done, I can now take a short breather, handle the various media enquiries and then move into a support role for others to take litigation, lay criminal compaints and deal with the various difficult situations they all face as a result of the Ormita fraud. I can’t predict the outcomes of publication of The Ormita Report for we are all entering uncharted territory, Daniel Evans is usually the one generating action but I do suspect that Daniel Evans and Ormita is ‘toast’ now and that there will be a series of legal challenges facing the conman and his one-man-band global empire. I don’t get pleasure from destruction per se, but when something is built on lies, deception and self-interest, and there is, as I say many times, a “trail of trauma” around the globe, then it will be great to see something so poisonous dealt to. The principal of Ormita loves to personalise business matters – it’s a trait of many people unable to deal with human relationships well – and I pride myself on distancing facts from feelings . . . BUT . . . I can also identify the feelings well. It DOES feel good to have gotten it all out in the open – much of it for the first time. I trust that you enjoy reading The Ormita Report. Once I’ve gathered my wits about me, I’ll be back and ready for more. I have a few ideas brewing for the next projects and a few people who want to work with me. Thanks for sharing the journey with me people. NSA is monitoring our words and movements. Security is just a pretext since most terrorism is state-sponsored.